I didn’t realize how long it had been since I posted new material here. I’ve been working on a few projects on the side, and time has just slipped by. I should be posting some nice bird images soon as well. I bought this atlas a couple of years ago, and as the binding was falling apart they were very easy to scan. I have decided that the atlas itself is not salvageable as at least one map seemed to be missing, the binding was disintegrating, the spine was missing, and the covers had fallen off. Thus, I am selling the maps individually in my bookstore, ZephyrusBooks.com, on this page HERE. There are about 100 maps in the book. This atlas had maps of all the French Departments and overseas possessions of the time. 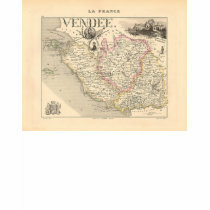 Every department of France at the time is represented on its own page, with political, demographic and other information on the reverse Vuillemin issued may version s of this atlas over the years, changing the border details, title decorations, fonts and the like over from edition to edition. The size would also vary, and while not the larges examples, these are larger than many. Alexandre Vuillemin (1812-1880) produced a number of atlases, and his maps are noted for the extensive margin illustrations – vignettes, famous people, and views of cities. Each map was titled with a different font, and the fonts, decorations and marginalia changed with each subsequent edition. Later editions were often more elaborate and sometimes larger than the maps I have scanned here. The date is approximate, but fairly accurate. I have checked the demographics given for each department against historical population figures, and the match the decade. The date, 1858, is printed on the large fold out map of France in the rear of the atlas. The full plates are available for free download in large resolution HERE. Individual thumbnails are below, each of which links directly to the page for the map itself. All are not loaded yet, but I am active working on it. The entire album mail be downloaded in ZIP format, or each image saved individually in a number of preset sizes. 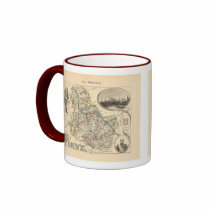 Posters, cards, stamps, mugs and other items with images of these maps may be purchased HERE. More to follow. All 101 maps are now in the gallery. I will remove this message when all are linked to here. In the meantime check the album HERE to see them all. Every department of France at the time is represented on its own page, with political, demographic and other information on the reverse. These are wonderful, great to see margin-illustrated maps, so much to look at. I can’t imagine the patience required! Thanks for making them available. Hi. It’s been a long time since we “talked.” Is the map of the Haute Garone from this book still available? If so, how much? Yes, it’s been a while. I hope you have been making good use of all the bird images. Let me know if the links do not work or if you cannot find it. The original is $145. There is a returning customer discount code you can use for 10 percent off. Enter ZBTEN2012 at checkout and it should take 10% off any order.